I’ve been working with a client to make molds for custom dolls and decided to print the mold on my CR-10 to see if I could print the molds for them for cheaper than Shapeways. It turns out the resolution wasn’t quite good enough for what they needed, but as far as I’m concerned it would work well enough for most things I would consider doing. The first image is some brown polymer clay straight out of the mold. You can see the layer lines and the Voldemortian nose, but it’s certainly not bad for something that cost 30 cents to produce. The middle picture is after I buffed out the layer lines with my finger (and distorted a lot of the face because it was stupidly hot in the room and the clay was mushy as all hell). The third picture is after I tried (valiantly, but to no avail) to add a nose and clean up the mouth a bit. I also added eyebrows that are more reminiscent of an angry old man than a young girl, but I haven’t worked with polymer clay in years, so shrugs? I think? 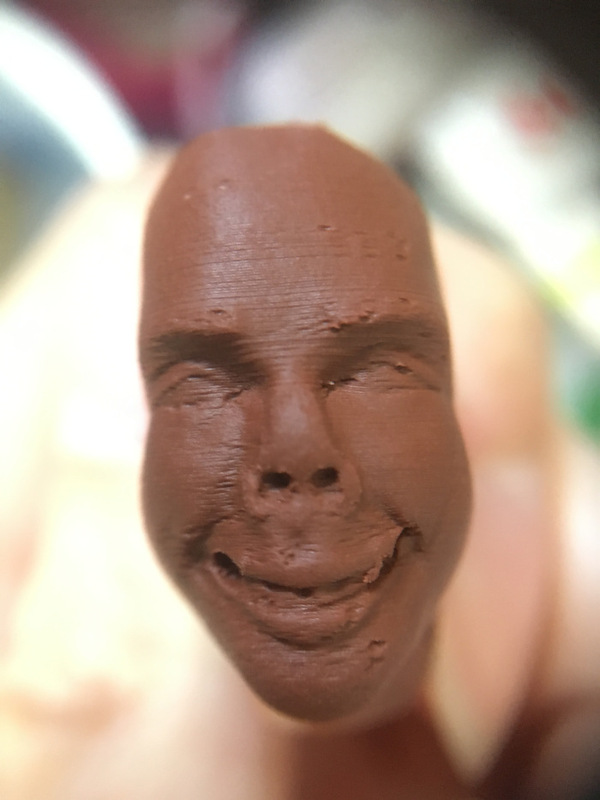 PLA seems to be a pretty good mold material for polymer clay. With the exception of the nose area, I didn’t need any kind of release agent to keep the clay from sticking. I’m pretty sure it only stuck in the nose because I actively jammed a little piece of clay into the nose and then I couldn’t pick it out again later. 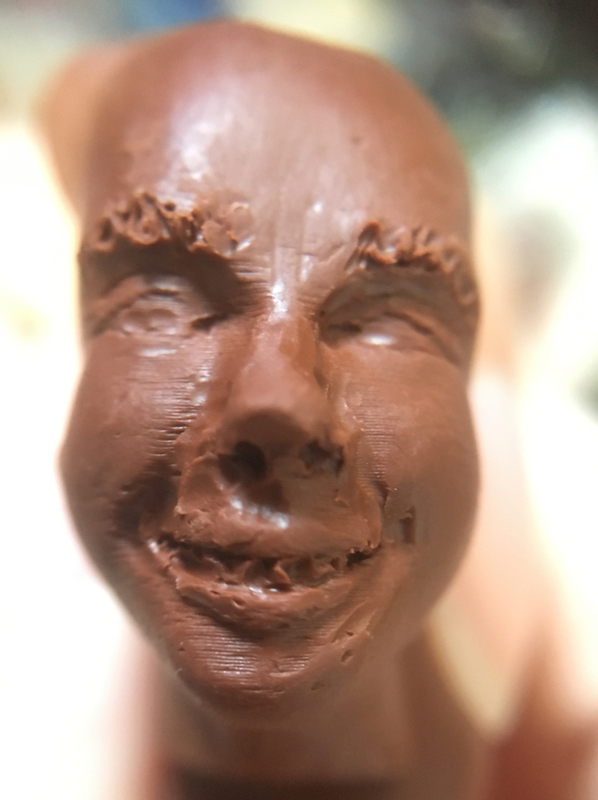 If I didn’t press the clay into the nose, it didn’t seem to get filled with I put the rest of the clay in, but that’s not the fault of the mold so much as the clay in my opinion. 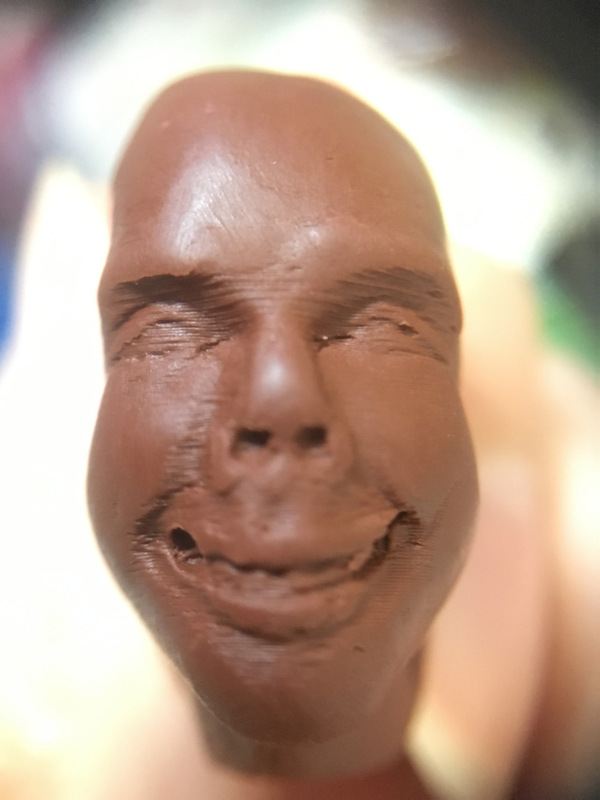 In the future, I might make more little 3d printed molds for polymer clay, etc… The ten minutes I spent fiddling with the face after I de-molded it made me miss traditional sculpting again. In the mean time, print on my people! Print on.